The Leatherhead Flood Group Meeting scheduled for Thursday 20th March at 7.30 will now be held at the Leatherhead Leisure Centre (in the Tylney Room) and NOT at the Methodist Church. Please find attached (see below) a press release about the forthcoming May elections that may be of interest to your residents and wider community. Mole Valley District Council published the 2014 Register of Electors on 17th February, ready for the upcoming Local and European Parliamentary Elections taking place on Thursday 22nd May this year. In order to vote at the elections on 22nd May, it’s important that residents make sure they are registered to vote. Hundreds of people in Mole Valley District could miss their chance to vote in local elections this May if they don’t take action now, Yvonne Rees, Returning Officer for Mole Valley, has advised. “Thursday 22 May is the chance for residents to have their say at Local and European Parliamentary elections”, explains Yvonne Rees. “We want everyone eligible to vote to be able to do so. Postal votes may be of particular benefit this year to those people whose living arrangements have been affected by flooding, and may have moved out of their homes whilst repair work is completed. Residents can of course return to their usual polling station, but a postal vote may be more convenient if they are unable to make it to the station on the day. The deadline to apply for a postal vote is Wednesday 7th May and for a proxy vote (someone who can vote on your behalf in person at the polling station) is, Wednesday 14thMay. 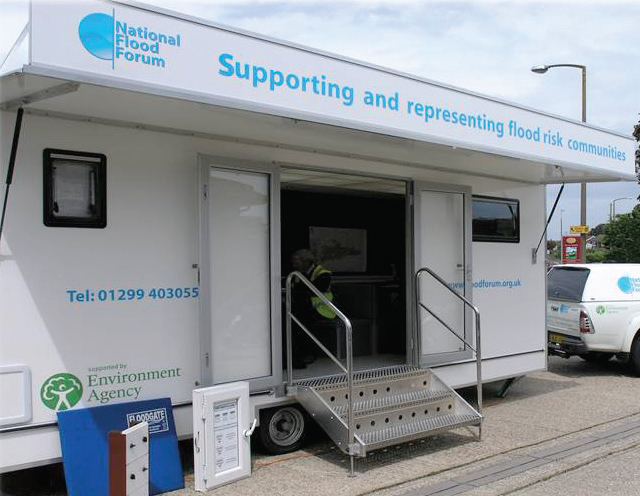 A Flood Forum Trailer is coming to Leatherhead on Friday, 14th March at the Leisure Centre Car Park from 10.00 till 19.00 with advice about Insurance, Flood Prevention etc. A representative from the Environmental Aency (EA) will be present when the Flood Action Group meets again on 20 March at the Leatherhead Methodist Church at 7.30. The EA is collating information and asking residents to fill in questionnaires. The questionnaires should be available at either of these venues. I am delighted to let you know that we have managed to secure the National Flood Forum’s flood trailer for an extra day – allowing it to come to both Charlwood and Brockham on Monday 17 March as well as to Leatherhead Leisure Centre this Friday. This additional day has been secured through the hard work of MV staff working closely with SCC and the National Flood Forum. We are delighted to have the trailer for a second day as we know that the advice and information it provides will be invaluable to residents and businesses affected by flooding. Naturally we will be promoting this as widely as possible and would appreciate your support also. You are invited to attend the Local Policing Board at B’free Youth Café, Kingston Road in Leatherhead KT22 7BT on Wednesday 12th March 2014. This is a great opportunity for you to have your say on how your streets are policed. The evening starts at 7pm and we look forward to seeing you there. I am writing to ask for your assistance in publicising the arrival of the National Flood Forum’s flood recovery trailer at Leatherhead Leisure Centre on Friday 14 March 10am to 7pm. The trailer provides specialist suport for flood victims in the form of advice and information in a ‘neutral’ environment. Where necessary the staff will act on a resident’s behalf to move an issue on with the relevant organsiation – e.g. insurance and they can provide a wealth of knowledge on a wide range of practical matters relating to flooding including flood prevention measures. The Flood Trailer has been in other areas of Surrey this week and will be in Guildford on Tuesday. I attach a poster which I would like to ask if you could display wherever suitable please. If you would like more detailed information about the National Flood Forum, please visit www.nationalfloodforum.org.uk. In addition, MVDC has also produced a handy Flood Recovery Factsheet as attached. Again, I hope that you could send this on to anyone who may be interested or it can be downloaded from our website from the ‘Flooding and Drainage’ page. If you would like to receive a supply of hard copies of this factsheet, please let me know. Still time for late submission! The consultation on the Housing and Traveller Sites Plan closed on Friday 7th March 2014, at 4pm. Comments can no longer be made through the online consultation portal, although you can still email the Planning Policy team at planning.policy@molevalley.gov.uk. Also all the documents are still available online by clicking here. If you know anyone who still has not submitted comments, ask them to email them to the address above. If you have any queries you are invited to phone planning on 01306 879281. Consultation on Mole Valley’s Housing & Traveller Sites proposals closes TODAY AT 4.00 PM! Have you submitted your comments yet? Sadly at the moment the comments show up only too well the North-South division in our town! Literally hundreds of people do not want to see the Green Belt built on in the south which separates Leatherhead from what? Givons Grove? But there seems to be far less concern about any of the bits of Green Belt still left which separate Leatherhead from Ashtead and Fetcham. If this goes, we shall have just one continuous strip of urbanization across the the north of Mole Valley. Is that what we really want?